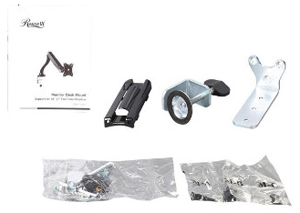 Home/Computer Accessories/Monitor Mounts/RMS-16001 – Single Monitor Gas Spring Arm Desk Mount , LCD Screen: 13″ – 27″, VESA: 75 / 100mm, Tilt: +90 / -45 deg., Swivel: 180 deg., Rotate: 360 deg., Max. Load: 13.2 lbs. 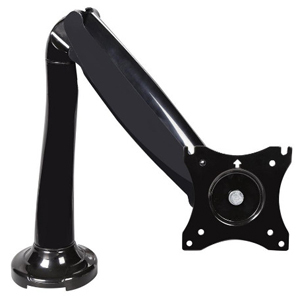 The Rosewill RMS-16001 is a high-quality, full-motion single monitor gas spring arm desk mount. It supports monitors/screens from 13 to 27 inches* in size, weighing up to 13.2 pounds, and is compatible with VESA 75mm and 100mm. 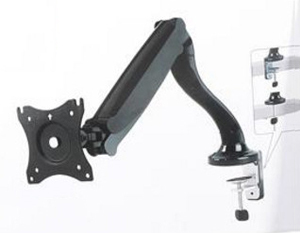 Once mounted to it, your monitor can extend, tilt, swivel, and even rotate for an optimal viewing experience. 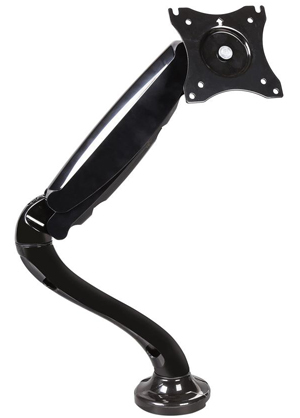 The sturdy aluminum arm with built-in gas spring facilitates easy height adjustment. The included hardware makes installation a snap. With full-motion joints connecting all parts, the Rosewill RMS-16001 can be adjusted for a comfortable and optimized viewing experience. Tilt as you wish: This mount can be tilted as much as 90 degrees upward or 45 degrees downward. This offers an easy way to keep your eyes in line with your monitor. Swivel as you wish: The 180-degree swiveling range makes collaboration and sharing a snap. Rotate as you wish: The 360-degree rotating range makes this desk mount fit any scenario. Leave it alone when you want to watch a blockbuster hit; rotate it vertically to check a large Excel spreadsheet easily. The sturdy aluminum arm with built-in gas spring allows for easy height adjustment with no tools required. The arm reach is up to 17.4 inches. The desk mount is compatible with VESA size of up to 100 x 100mm. All hardware is included for easy installation. 1.Monitor size is for reference only, please check your Monitor VESA and weight spec. 2.Actual specifications may be improved from time to time. Please refer to the website for the most up to date specifications.